• Aoyama drew 6 original scenes for M21. 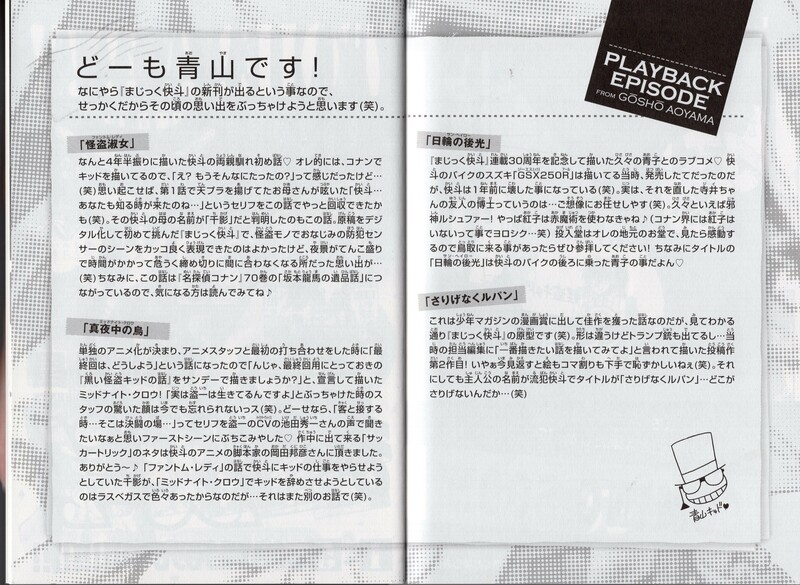 He also revised almost all scenes of romance moments, and checked all scenes involving Kazuha, Heiji, Momiji, Ran, and Conan. • "When will Heiji confess to Kazuha?" M21 brings about such feeling. • It was decided before the release of M20 that M21 would be a love story about Heiji and Kazuha. Aoyama wrote it replying some postcards of 2016. • The idea of using Karuta as the main theme of M21 was raised up around the release of M20. • The character Ooka Momiji was designed as a girl from Kyoto that would appear in M21 as Kazuha's love rival, before Aoyama decided to introduce her to manga (on her first appearance). On the M20 celebration on 04/15/2016, Aoyama decided to let Momiji briefly show up in the manga series so that her later appearance in M21 wouldn't seem too abrupt. Aoyama decided her family name to be Ooka, but her given name Momiji was decided by other people. • Momiji will appear again in the future as a rival. With a very rich and powerful family, she can be considered "the Sonoko of the west". People can imagine things like her family having bad relationship with Suzuki Jirokichi, which would be interesting. • Iori Muga was designed by Aoyama, although the character was at first designed to be an old man. It was then changed to the handsome young butler as he is, who's very faithful to Momiji. He's not speaking in a Kyoto accent. • Both Momiji and Okita Soshi will appear again in the manga. • File 1000 series will be a big event of the high school boys and girls. The love story of Ran and Shinichi will take place. Heiji and Momiji will also show up. 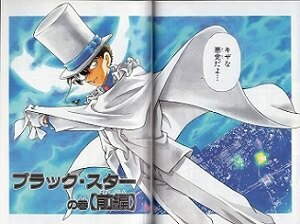 Since a new volume of ''Magic Kaito'' came out, I have to delve into my memories from the past. I wrote this story about Kaito's parents four years ago. 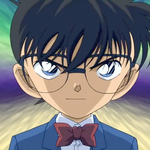 I had stopped writing Magic Kaito for Conan and I thought : ''Wow, so much time has passed ?'' (laughs) If I recall correctly, his mother mutters ''Kaito, it's time for you to know'', and the story's finally here ! It's this story that finally revealed that Kaito's mother's name is ''Chikage''. It was my first time digitalizing a manuscript, I was glad I managed to portray the security sensor similar to phantom thieves stories so cooly, but I had to drew one night scenery after another, and that took time and so I almost didn't make it in a deadline. By the way, this story leads to Conan's Ryouma case, in volume 70. Read it if you're interested ! Speaking of characters, Lucifer appears again ! As I thought, Akako uses red magic ! (Fortunately Akako doesn't exist in Conan's world (laughs)). The entrance hall in the chapter is based on Tottori's entrance hall, so please go there if you visit Tottori ! By the way, in Sun Halo, Aoko rides the bike with Kaito ! Thanks to Yunnie for the help. Well, there you have it (though he likely said something along similar lines, at least once before). The 98th National High School Baseball Tournament is finally going to start. 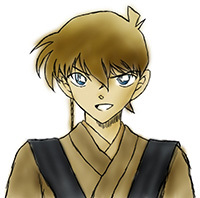 In order to give some support to the Tottori baseball club members who have been training hard for this competition, Goushou Aoyama, a manga artist from Hokuei-cho who works on the ''Detective Conan'' series, gave us an interview as well as a drawing. Q: I heard that you like baseball. What made you like it? A: (Shigeo) Nagashima, of the Giants. Q: Did you watch high-school baseball when you were in high-school? A: I have vivid memories of the extended game with (Tatsunori) Hara of Toukai University and (Shouji) Sadaoka from Kagoshima Jitsugyou. The game lasted until late at night, I was seeing that the game was going to be hard to settle, my hands were sweating. Q: A high-school base-ball player was also the protagonist of your short story ''Third Base Fourth''. What was the best part of writing it? The game Aoyama-san mention was the Toukai University vs. Kagoshima game of the quarterfinals of the 56th National High School Baseball Tournament, 1974. After 15 extension times, Toukai University lost 4 to 5. Hara was a fielder and Sadaoka was an ace. Goushou Aoyama. Born in 1963 in Hokuei-cho (former Daiei-cho). He graduated from the Nippon University College of Art. In 1986, he won the Shogakukan Newcomer Award given by Shogakukan, and started serializing "Detective Conan" in the ''Weekly Shounen Sunday" beginning from 1994. The series consists of 89 volumes to date, translated and published in 21 countries around the world. It also became TV show, and the 20th movie, ''Pure Black Nightmare", will be released this year. 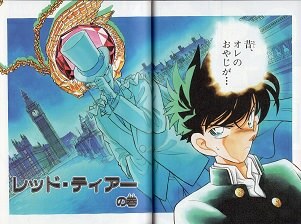 Besides Conan, Aoyama has drawn ''Magic Kaito'' and ''Yaiba''. Thank you for both of these ^_^ !! Anime ! Anime ! (will be shortened as ''AA''): This time, even if there has been some attempts before, the criminal is a sniper, right ? Aoyama : That's right. Up until now, there were a lot of bombing cases, so I thought it would be great to have a movie with a sniper. In my mind, the idea that the criminal could see without being seen was thrilling. Well, since Conan has criminal-tracking glasses, he's a bit like a sniper himself (laughs) Even though the movie is suitable for kids, there are certain parts of the film that are more adult. AA: It's also the first time important manga characters like Masumi Sera and Okiya Subaru make an appearance in the movies. Aoyama: It's the first time we've done so much. Even if there's nothing in this movie that hasn't been shown in the manga, there's still a scene that is a spoiler and that hasn't been drawn in the manga. AA: How much were you involved in this movie ? Aoyama: I'm very involved, and it has been like this since the first movie. The fans of the manga want to have fun watching the movie after all. I like Monkey Punch's viewpoint, which is to let go and let the production team do their work alone, but I like being involved. 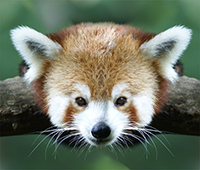 Of course, it's difficult to be very involved because how busy we are. AA: Conan movies are released annually, but what do you do with them [in the original work] ? Aoyama: Well, if, say, it's a Kaitou Kid movie, I'm going to make Kid appear in the manga as well, because it's exciting to have both. It's like a biorythm ! As Olympic athletes who train to prepare for the event, I do the same with the manga. It's the first time that the story of the movie is the same as the manga and it's exciting. AA: How was it to have Sota Fukushi-san (as Kevin Yoshino) and Patrick Harlan (as Jack Waltz) in the movie? Aoyama: Fukushi-san was the first actor to be chosen, and his performance in the climax of the movie is very good. Patrick-kun's acting is great too. AA: After having watched the movie, what scene left an impression on you ? Aoyama: The climax scene at the Bell Tree Tower. If you watch the movie, you'll find that scene thrilling for sure. AA: The manga celebrates its 20th birthday, and this is the 18th movie. But where do all your ideas come from ? Aoyama: I study closely the movies and dramas I watch. My personal favorite recently is ''Inspector Fukuie's Greetings'', I like its music. I'm also watching ''Lone Ranger'' and ''96 Hours of Revenge'' these days. There're a lot of mysteries in these films, so I rewind them when there's an interesting line. The scripwriters are my peers in this industry. AA: Amid the good guys and the villains, there are some profound characters with various backgrounds. Please tell us more about character-making. AA: Not only do famous actors appear in the movie, but there's also Shibasaki Kou. There was also a collaboration with Lupin the Third. Is there a collaboration you would like to do in the future ? Aoyama: Doing a collaboration with Lupin the Third was a wish come true. I didn't think it would be done one day. We are preparing another collaboration in order to celebrate Conan's 20 year anniversary, it will be out this autumn. Some details are going to be made public, stay tuned! AA : Finally, could you give a message to your fans ? Aoyama : The ending of the movie is very cool. You should read the Sunday after reading the movie. But no worries if you don't ! 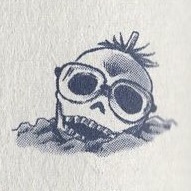 (laughs) There's going to be something very important in the Detective Conan chapter of the Shounen Sunday of the 23rd of April. ''Scarlet Showdown'' is going to be released, so watch it along with the movie ! "Gensaku" is a term to the refer to the "original work", that is, the manga. So you can replace it with "the manga". Good job and thanks for providing these translations as well! I found a complete translation of Aoyama's interview! Ran-dezvous wrote: I found a complete translation of Aoyama's interview! Yay thank you for sharing!